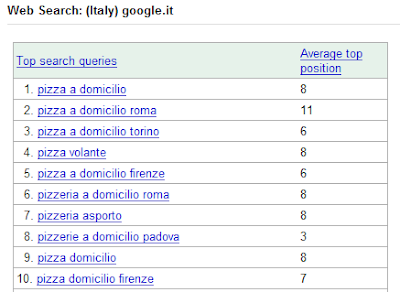 Stefano Bittante: Pizza a Domicilio, removed again from Google index? Pizza a Domicilio, removed again from Google index? I have no words, it seems that Google is making fun of me. After two days of traffic (when I wrote "back into Google index"), now there isn't anymore. But what really makes me upset is the fact that even Google seems not to be aware of this. But this is not true. Actually the first occurrence of "Pizza a Domicilio", displaying 100 results per page, is on the last one, the eight. This means that the true positioning is after the 700th.